This post contains affiliate links to help support my work & kimchi addiction. For more information, see my full disclosure policy. My first introduction to kimchi was in the form of kimchi fries. A great big pile of thick french fries, topped with beef bulgogi, some form of mayonnaise sauce, and somewhere in the mess of fat and salt, they had hidden some kimchi (regular, not vegan kimchi like I now make). I’d heard about the spicy fermented condiment, and had just enough of the hint of spice to know I needed to try the stuff in its true, pure form. The next time I was at Whole Foods, I picked up a jar and have been hooked ever since. Kimchi alone is salty, tangy, spicy, and crunchy. It’s a low-calorie, high-fiber, and nutrient-packed snack, side dish, or flavor component of many main meals. 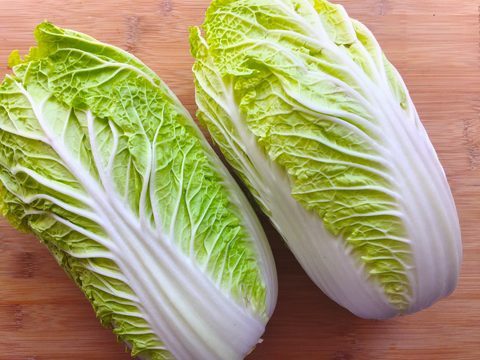 It’s also packed with health benefits thanks to the process by which its made – the cabbage and other vegetables are fermented with probiotic lactic acid bacteria (LAB). There are many other bacteria, but LAB become dominant while harmful bacteria are suppressed thanks to salt and the fermentation process itself. 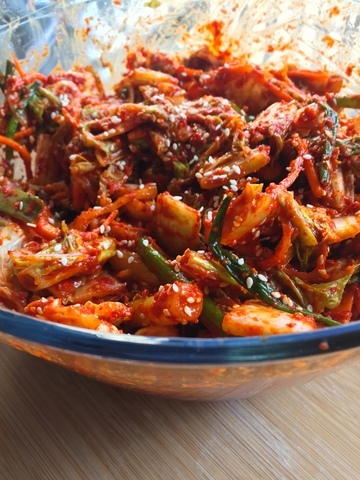 Like all probiotics, kimchi promotes digestion and gut health. Here’s a really great overview of why probiotics and gut health are so important to overall health and wellness. Unfortunately, kimchi is also expensive when store bought. You can expect to pay $8 and up for quality kimchi, and if you eat it as much as I do, that adds up very quickly! I was so delightfully surprised to learn that it’s actually very easy to make yourself, and the ingredients are their own are not very expensive at all. 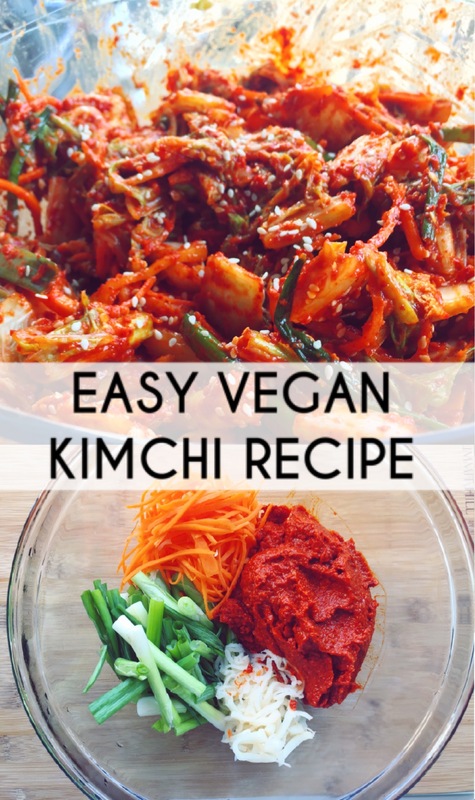 Today I’m sharing my recipe for easy vegan kimchi. It’s also gluten-free and soy-free, and can be easily adapted for whatever ingredients you have on hand. If you have an Asian market near you, I’d suggest going there as a one-stop shop. If not, I’ll link some products below and suggest alternatives that you can find at any grocery store. If you’ve never fermented anything before – don’t be afraid! 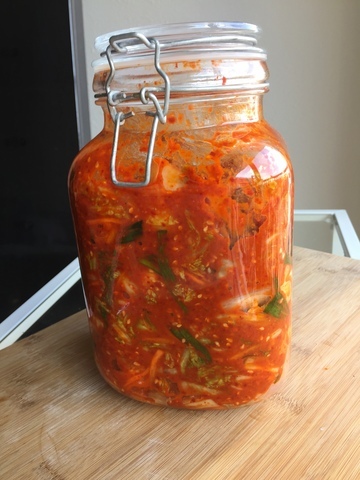 Fermentation is actually very forgiving and kimchi is probably one of the easiest ferments you can do because it likes an air-tight environment. There are three steps to making kimchi: salting the cabbage, making kimchi paste, and fermentation. 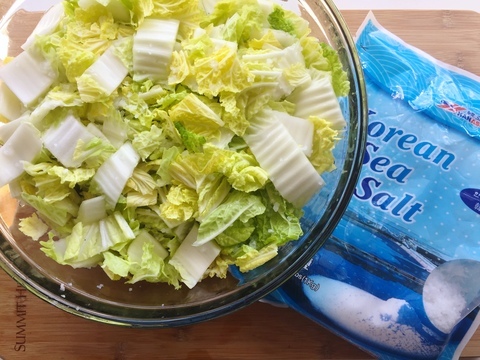 Salt pulls excess moisture from the cabbage and ensures a crunchy end product. Don’t be worried about the amount of salt this step requires – we will be rinsing it off later. That’s why the salt you choose is important in making sure you get that crunchy texture and that your kimchi does not end up soggy or too salty in taste. The best choices are mineral-rich course salts. Stay away from regular table salt and any iodized salt because chemicals and anti-clumping agents often found in those products can interfere with the fermentation process. The Fermented Food Lab has a good guide to choosing salt. I picked up Korean Mineral Sea Salt at my local Asian grocery store and I really like it. The 1lb bag has lasted me for months and I’ve been using it in my other ferments, not just kimchi, with great results. It’s much coarser than any other salt I’ve found. Celtic Sea Salt or even Pink Himalayan Salt are both sold in regular grocery stores or online and are also good options. I like to break down my cabbage before I salt it, but I’ve seen lots of people keep the cabbage halves intact so you could do it either way! 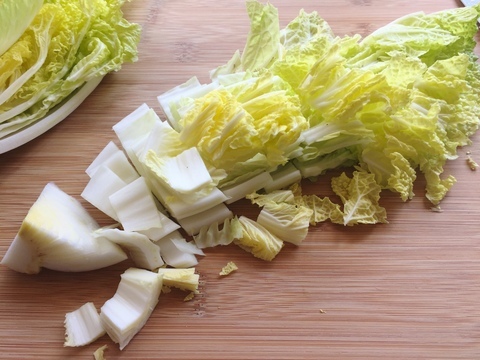 I’ll usually slice a couple of inches up into the core and pull apart the length of the cabbage, then cut the strips into bite sized pieces, discarding the core at the end. Rinse the cabbage well and measure out your salt. Then in a big bowl, toss in a layer of cabbage, followed by a layer of salt until you’ve used up all of the salt and cabbage. Give the mixture a little toss and let it sit. It may take a couple of hours to fully expel the excess water. Toss the mixture and give it a little squeeze every hour until you can bend a piece of cabbage without it snapping. That’s how you’ll know it’s ready. Next, we’re going to rinse off as much salt as possible. I do this by grabbing a handful and rinsing it well in a colander before I add another handful, repeating the process until I’ve rinsed all of the cabbage. Repeat the process on the cabbage three times. 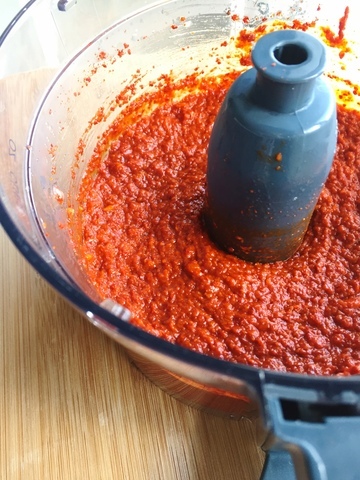 This step seems tedious but it really is important to make sure the flavor of your kimchi paste is balanced and not too salty. While the cabbage is sitting, you can prep your add-ins and kimchi paste. 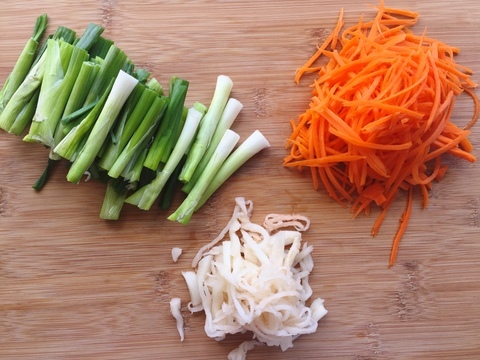 My favorite add-ins are shredded carrots, shredded daikon, and green onions. I use a Julienne Peeler Slicer to get the fine, long shreds of vegetables (you could use pre-shredded or sliced veggies) and chop 2 bunches of green onions into thirds, discarding the roots. Traditional kimchi paste requires salted shrimp and fish sauce, as well as gelatinous rice flour. My kimchi paste is totally vegan. To get the depth of flavor usually provided by sea food, I’ve opted to use sea vegetables, specifically kombu which is dried seaweed. You can order a package here but I’ve also seen it at any Asian market or Whole Foods. Add 3/4 cup water to a small sauce pot with a sheet of kombu (about 4in x 4in). If you do not have kombu you can just omit. Bring the water to a boil, remove the kombu, and turn the temperature down to medium-low. Add 1 tablespoon of sweet rice flour and use a whisk to incorporate to the water. Try to get as many clumps out as possible, but it can be difficult so don’t worry if it’s not perfectly smooth. Stir consistently until you get a thick, bubbly paste, then set aside to cool. You can find sweet rice flour (also called glutionus rice flour) in the Asian or specialty baking section of a grocery store. Bob’s Red Mill is a very common brand and has a sweet white rice flour, and this is the brand I use. This whole step is totally optional. The purpose of making a paste from sweet rice flour is so the kimchi paste mixture sticks to the leaves. I personally like the texture it provides because it makes for a thicker sauce rather than a thin brine, but if you cannot find the ingredients or don’t want to do this step, leave it out and make your paste with the rest of the ingredients. While the rice flour paste is cooling, prepare the rest of the kimchi paste. 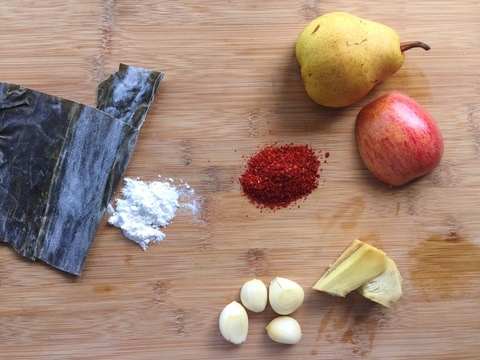 You’ll need an ounce of fresh ginger and 3 large cloves of garlic, 4 ounces of a sweet fruit like apple or pear, salt, and one essential spice – gochugaru. Most of these ingredients can be omitted or swapped based on preference or availability, but you will not get the signature kimchi spice without gochugaru. I buy my gochugaru in a giant bag at the Asian grocery store or online. This is the brand I use and I really like it. It has great spice, and the signature smoky sweet flavor is very present. The coarse flake is also perfect for sprinkling on tons of other foods that need a little kick. 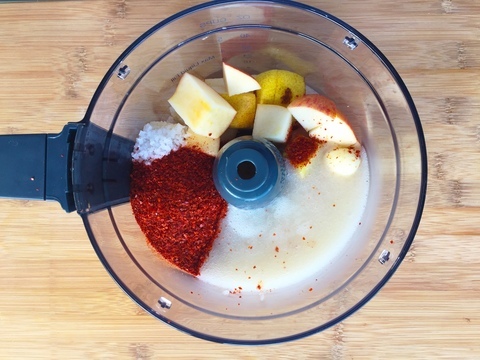 In a blender or food process, combine your garlic, ginger, rice paste if using, gochugaru, salt, and fruit. The fruit will provide the bacteria with food to kickstart the fermentation process. I’ve had success with apples and pears, so use what you have. You should be left with a bright red paste – that’s the good stuff! Using gloves or tongs (not your bare hands) mix the cabbage and add-ins with the paste and about 2 tablespoons of sesame seeds if you’d like. Toss the mixture well to ensure all of the cabbage is well coated in paste. The last step is to pack the kimchi away to ferment. The most important thing when packing your kimchi is to make sure the top layer does not get exposed to oxygen or it will likely grow mold. You can do this in a few ways. 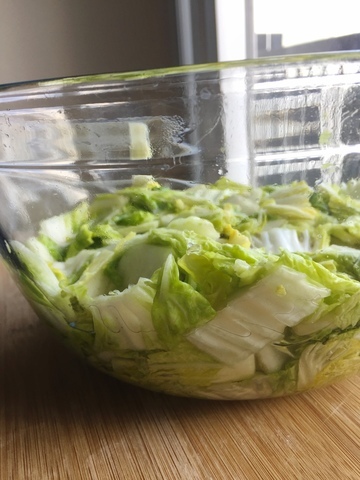 If your kimchi is packed tightly enough, the brine should rise above the cabbage and keep it submerged (this is how I usually ferment). If the cabbage is not staying down, use a whole cabbage leaf to tuck it in, or place a plastic bag in the jar, fill it with water, and let the weight press the cabbage down. You want a seal against the oxygen but not an air-tight container because bacteria release gas as they ferment and the pressure could lead to an explosion if there is no way for the gases to escape. Finally, the hardest part – tuck your beautiful kimchi jar away on the counter or in a cabinet and wait until the fermentation process works its magic! I like my kimchi really tangy so I let my bigger batches sit for 10-14 days. When I do half of the recipe it is ready in 4-7 days. You can taste it at any point in the process, but don’t expect any of the tang to be there until at least 2 days in. Once your kimchi reaches a level of funk that you like, seal it up airtight and place it in the fridge. Kimchi and other ferments will last for months in the fridge. I don’t know exactly how long before it goes bad, because mine gets eaten too quickly! But since fermenting is a natural way of preservation, it’s perfectly safe to hang on to for a while. Since the fridge doesn’t fully stop fermentation, it simply slows it, your kimchi will continue to develop more of its signature flavor the rest of its life. Have you made kimchi before? I’d love to know if you have any tips or tricks I missed. Let me know how you use your kimchi too! I love eating it plain, making kimchi fried rice, or using the juice as a marinade for meats or vegetables. This recipe will make about 4.5 lbs of kimchi. I recommend using at least a .5 gallon fermentation container. Break down the napa cabbage into bite sized pieces and discard the core (see notes above). Rinse the cabbage well, and working layer by layer, add cabbage then salt to a large bowl until both are used up. Give the cabbage and salt mixture a good toss and let it sit until all of the excess moisture has been expelled from the cabbage. This may take a few hours. Check on the cabbage and give it a toss and squeeze every hour. The cabbage is ready when you can bend a piece of the thick stem without it breaking. When the cabbage is ready, work in batches to rinse the salt mixture from the cabbage with cold water. Rinse all of the cabbage three times, until the majority of the salt is removed. If you are unsure, taste a piece of cabbage. It will still be salty but should be palatable. Set the cabbage aside to drain while you prepare the kimchi paste. In a small sauce pan, boil water with kombu sheet. Once the water is boiling, remove the kombu and turn the heat down to medium-low. Add the sweet rice flour. Whisk the mixture consistently making sure the paste doesn’t burn or stick. Try to break up all of the clumps, but if you can’t don’t worry. They will be incorporated when we blend the paste later. Simmer the mixture over medium-low heat until it comes together into a paste and begins bubbling. In a blender or food processor, combine ginger, garlic, apple or pear, salt, gochugaru, and cooled sweet rice flour paste (if using). In a large bowl, combine the drained cabbage, add-ins, and kimchi paste. Using gloves or tongs, mix it all together until the paste evenly coats the other ingredients. Do not use your bare hands – the chili paste will burn them. Transfer the kimchi into your fermentation container (see above for recommendations). Pack the kimchi down so the top is submerged in brine or use one of the methods above to create a seal against oxygen. Set your kimchi in a space it can sit and ferment for 1-2 weeks. Check on it occasionally beginning about 2-3 days in and taste it. Once it reaches your desired level of fermentation, seal the container air-tight and put it in the fridge. Look for signs of mold on the top (blue or white fuzz). If you see mold, scrape it off and discard, along with a scoop of the surrounding kimchi. If it spreads below the top layer, you may have to discard the batch and start again (I’ve only had this happen once when it became exposed to oxygen!). Kimchi will last for months in the fridge. Enjoy it plain or use it in recipes!